PUKALANI — Hoala Alapai got the message from her older teammates on the Kamehameha Schools Maui girls volleyball team loud and clear on senior night at Kaulaheanuiokamoku Gym. Alapai’s 19th kill of the evening finished a 17-25, 26-24, 25-22, 25-15 win for the Warriors over Lahainaluna that nailed down second place in the Maui Interscholastic League Division I regular season. 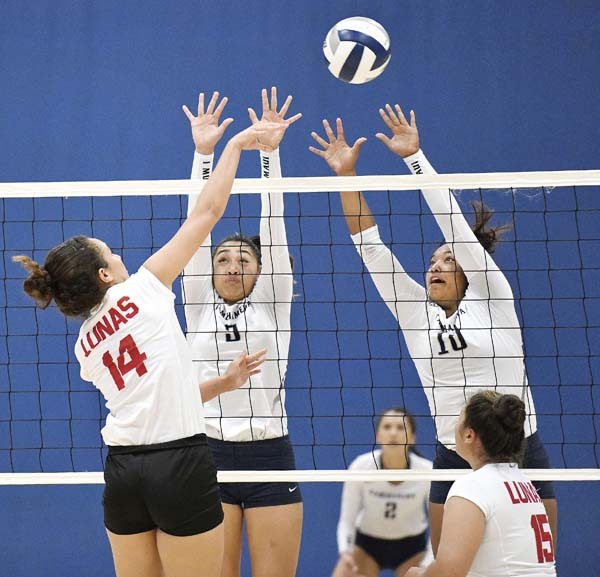 The Warriors (7-4) and Lunas (5-6) will meet in a crucial semifinal in the MIL D-I tournament on Monday at the Lahainaluna gym — the Lunas must win to keep their state tournament hopes alive, while the Warriors can nail down a state berth in that match. 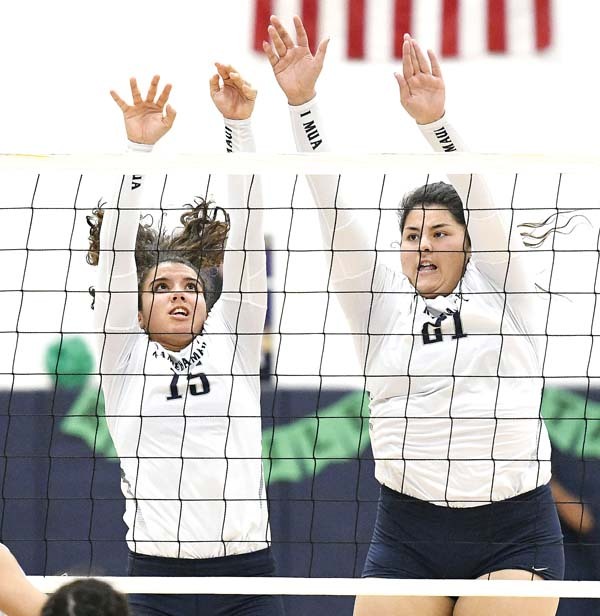 Had the Lunas won to push the teams into a tie in the standings on Thursday, they would have finished a match in Lahaina on Saturday that the Lunas led two sets to one before it was postponed by a power outage — that match will not be finished. Lahainaluna players celebrate a first-set block Thursday. The Warriors took a 7-4 lead in the fourth set on a kill by Alapai, prompting a timeout from Lahainaluna coach Trixy Nuesca-Ganer. Kills by Sofia Stupplebeen and Alapai pushed the lead to 9-4 and another kill by Alapai made it 11-5. A kill by Kaena Cervantes gave the Warriors a 13-7 advantage before a resounding, straight-down kill and ace by Logan Spencer made it 20-12. 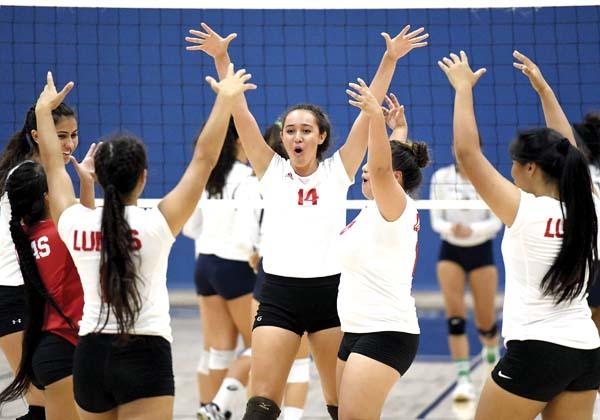 Alea Cervantes had nine kills and 16 digs, Spencer had eight kills, 13 digs and six aces, Meleana Hoopii had 19 digs and Taylor Morita and Kayla Yamashita each dished out 24 assists for the Warriors, who were swept by the Lunas in the teams’ first meeting in early September. The Lunas rolled to the first set after building a 17-9 lead midway through. Kamehameha Maui’s Logan Spencer (left) and Tatiana Martinez defend the net in the second set. The next two sets were nailbiters down the stretch. Lahainaluna led the second 17-13 before Kamehameha Maui caught up at 19-19. The Lunas took 21-19 and 24-22 leads, but the Warriors rallied to score the final four points to take the set — the run started with a kill by Spencer, followed by two straight kills by Alapai and was finished by an ace by Spencer. The third set followed the same path. The Lunas led 11-6 and 16-10 before the Warriors caught them at 21-21 on a kill by Tatiana Martinez. Another quick set to Martinez made it 22-21, an ace by Hoopii pushed the lead to 23-21 and an ace by Morita finished the set. The Lunas did not keep statistics, but Nuesca-Ganer said her team will be ready for a must-win effort on Monday. Hana at Seabury Hall, 6 p.m.
Maui Prep at Lanai, 7 p.m.